Zlatan Ibrahimovic definitely has a larger than life persona and is the idol of a lot of kids, who want to be just like him when they grow up. 2 Swedish mascots were completely shocked and in utter disbelief when they got to stand next to him before Sweden’s European qualifier against Montenegro. 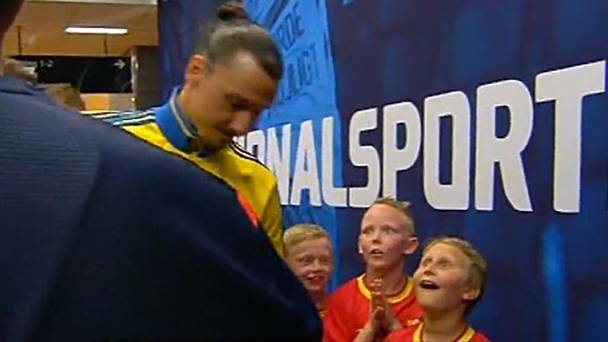 As he teams were getting ready to leave the tunnel, the two boys were stunned as Zlatan came and took his place at the head of the Sweden team, as he exchanged pleasantries with the referee. The two boys were awestruck, as their faces were full of admiration for the Paris Saint-Germain striker. In fact, they were so affected by the moment that they had to pinch each other to understand that that was indeed happening and that they weren’t in a dream. They also proceeded to make a gesture as though they were thanking God that they were able to meet Ibrahimovic.